Today I passed the 44 mile mark .Being Remembrance Sunday made it more poignant as I remember a friend , Kevin Astley . He was a fellow fly swimmer , much faster than me I have to say . We joined the swimming club at a similar time and became good friends . 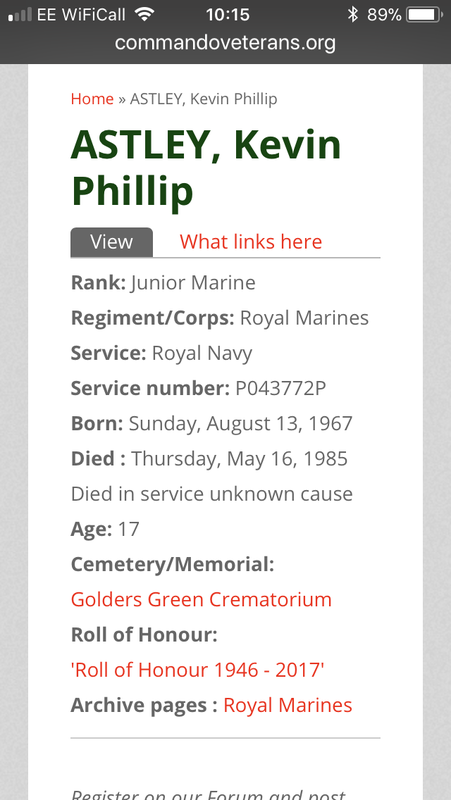 He completed his Royal marine training but was sadly killed shortly after his passing out parade. His death was a huge shock to the whole club as he was such a lively person. He gave 100% to everything he did. I remember him every year but this year I seem to have remembered him more as I have swum those very hard lengths. My first few lengths of fly today brought me to tears and goosebumps which completely floored me . I have always felt it was such a waste of life but have come to realise that his short life made an impact on me encouraging me to carry on and use the some of the qualities he showed . Swimming and sport are to me truly much more than just a way to keep fit . With me in good and bad times and quietly comforting along with the highs and lows they bring . The friends and family I have made will always be special to me including those no longer here . Rest in peace Kevin and thanks .